Don't miss Peggy's Cove, even if you just have a few days in Nova Scotia. With less than a week in Nova Scotia, you’ll need to be well organized to see the best the province has to offer. The remainder of your time can be arranged as a series of day trips from Halifax, allowing you the chance to sample the capital’s restaurants and nightlife while still seeing some of the province. This does, however, involve more driving than if you connect the different destinations into a loop. Whether you use Halifax as your base or move on, the following destinations are among the highlights you’ll want to squeeze in. 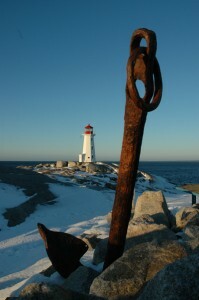 Peggy’s Cove Lighthouse and the South Shore should definitely be at the top of your list for Day 2. Continue down to charming Mahone Bay, with its churches, boutiques and art galleries, and the colourful settlement of Lunenburg. Here you’ll want an hour or so for the Fisheries Museum of the Atlantic or hop on a boat tour from the harbour. Peaceful Chester is worth a look on the way back if you still have energy and sunlight. Day 3 might bring you towards the Annapolis Valley. Stop at Wolfville to investigate the cultural university town (it’s a fine place to have lunch) and try the wine in Grand-Pré. Outdoor types will want to check out the hikes and beaches around Cape Blomidon Provincial Park. If you’re not committed to returning to Halifax, spend the night in Wolfville and then use Day 4 to carry on south to Annapolis Royal and Fort Anne, perhaps with a small detour to the artistic haven of Bear River. Alternatively, with an early start you might fit in a feed of scallops and a whale-watching tour from Digby or Brier Island before you return to Halifax. Day 5 is the perfect time to explore the Eastern Shore with its coves and forgotten villages, not to mention the historic Sherbrooke Village, Nova Scotia’s largest museum and a great spot for kids. Another option is to head towards Truro to try out tidal bore rafting and check out the Shubenacadie Wildlife Park. 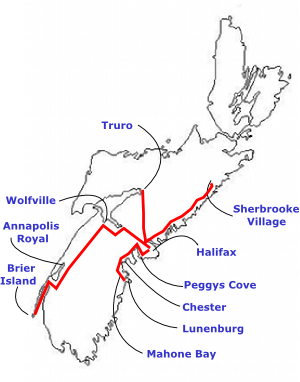 You may notice that Cape Breton is missing from this outline. If time is short it’s hard to do the island justice so you’re better off enjoying closer sights.